As seals became more difficult to harvest in quantity during the mid-19th century, Newfoundland outfitters turned first to larger sailing vessels and then to wooden-hulled steamers. They were following the example of the Scottish whalers from Dundee. When the whalers' usual grounds at Jan Mayen, Greenland and the Davis Strait began to decline, they introduced steamers into the industry. Then they tested diversification. The Dundee Seal and Whale Fishing Co. decided to try sealing at Newfoundland, estimating that after unloading seals at St. John's, a steamer could then sail north to the Davis Strait. Thus in 1862 the Polynia and the Camperdown arrived in Newfoundland. Though the Dundee steamers did badly that spring, St. John's merchants had seen the future. 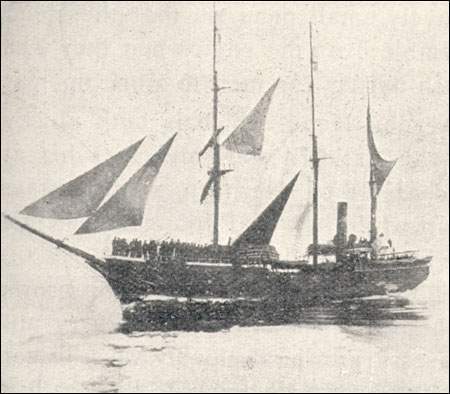 The next year two firms with Scottish connections purchased one small Dundee steam whaler apiece, and sent them to the ice, where they did relatively well. Others soon followed - though this was an investment that by no means all merchants could afford - and in 1870 the fleet included ten steamers. The large sailing ships recently acquired were mostly sold. The SS Diana was one of the first specially built sealing steamers. From Michael Condon, The Fisheries and Resources of Newfoundland (St. John's, 1925) 237. D.W. Prowse was to lament that the arrival of the 'wooden walls', as these auxiliary steamers were known, was 'a poor day for Newfoundland', but that depended upon one's perspective (Prowse 453). Those merchants who made the investment saw their buying of wooden-hulled steamers as no more than a necessary extension of the trend towards larger vessels and concentration of ownership that was already evident, and they were repaid by a significant rise in productivity. The number of seals caught per ton of shipping among the steamers was more than double the rate among sailing vessels, and the man/ton ratio also improved. By the late 1860s, the value per ton employed in the seal fishery edged back to the level attained 20 years before. The expansion of the steamer fleet continued until 1880, when 24 vessels averaging 320 tons each and carrying a total of 5,000 men participated in the seal fishery. Thereafter a plateau was reached - though there was a decline in the later 1880s and early 1890s - which lasted until the First World War. Steam concentrated the sealing industry in fewer hands and fewer ports. Sailing vessels just could not compete with the new technology, which was more efficient, and attracted not only investment but also the better sealers. Instead of a swarm of vessels setting out from numerous outports as well as St. John's, the later 19th century saw a much reduced sealing fleet, for the most part owned in St. John's, setting out from a few centres. The decline in sailing vessels was dramatic. Nearly 400 had gone to the ice in the late 1850s, but perhaps only 120 went in the early 1870s. Harbour Grace in Conception Bay had sent 58 schooners and 2,400 men sealing 1868; 18 years later it sent no sailing vessels at all. The decline in the number of vessels was accompanied by a decline in the number of men carried. At its peak in the period 1880-84 the steam fleet carried on average 4,640 men, a far cry from the 14,000 of 20 years before. This drop is perhaps exaggerated by our ignorance of the number of schooners that continued in the seal fishery during this period, but not by very much. The result of these changes was that the wealth generated by sealing was far less widely dispersed, and the local economies of those areas which had depended upon it were badly hurt. This was particularly true of Conception Bay, which also suffered from the slightly later decline in the profitability of the Labrador fishery. A significant emigration is reflected in the census figures. Harbour Grace declined from 14,727 in 1884 to 12,671 in 1901; Carbonear from 6,206 to 5,024. Those who remained had to adopt more varied patterns of occupation, combining fishing, mining, wood work, labouring and seasonal migration to the mainland. But even if there had been a more equitable distribution of the earnings, there would have been less to share. The high yields of the 1830s and 1840s were never again approached, and there was increasing evidence of depletion. The legislature passed legislation in response - regulating sailing dates, for instance, and banning second trips - but its effectiveness is difficult to evaluate. In any event, fewer seals did not mean higher prices. The price of sealskins, which had risen to an average of just over a dollar each in the late 1860s, fell by about 15 percent by 1900. Much more dramatic and significant was the collapse of the seal oil price, from $163 per ton to $75 over the same period. There were many other sorts of hide from which leather could be made, and seal oil was no longer used in machine oil, for instance, or the manufacture of jute. In the lighting market, it had to meet the competition of kerosene. The overall value of seal products fell from over $1 million in the late 1860s and early 1870s to a miserable $478,000 in the late 1890s - a low point, let it be said, which was not reached again until the 1920s. From over 30 percent of the value of Newfoundland exports in the 1850s, seal products fell to less than ten percent by the end of the 19th century.